Presenting the Theatrical Trailer of "ABCD - American Born Confused Desi". Starring Allu Sirish, Rukshar Dhillon in lead roles. 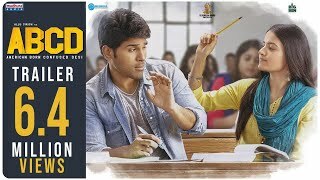 This movie is presented by D. Suresh Babu under the banner Suresh Productions, jointly produced by Madhura Sreedhar Reddy and Yash Rangineni on Madhura Entertainment and BigBen Cinemas, co-produced by Dheeraj Mogilineni, Directed by Sanjeev Reddy. Direction Team - G.K Chowdary, PC Poorna, Kasi Akula, Giridhar Pasupuleti, Chandu Huggihella, Lavanya Krishna, Vijay Kumar, Rajdixith, Uma Beeram, Mohan Marisetty, Sudarshan KC Reddy, Basi Reddy Rana, Sudheer Varma.